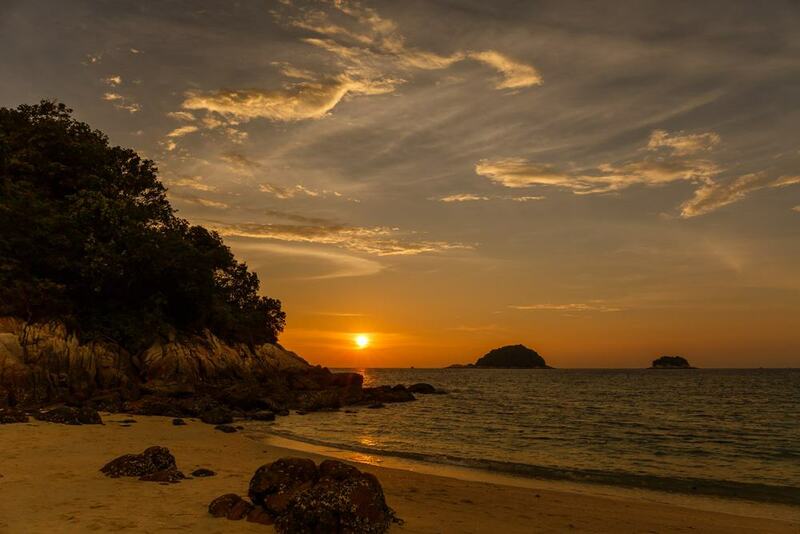 Pangkor Island in Perak has empty beaches, a colonial fort and hundreds of hornbills. The small island in the Straits of Melaka is less than 200 kilometers (124 miles) northwest of Kuala Lumpur. Pangkor remains under the radar, and visitors feel like they have the place to themselves. And it’s close enough for a side trip from the capital. Expect empty coastlines, a colorful Chinatown and a traditional lifestyle. 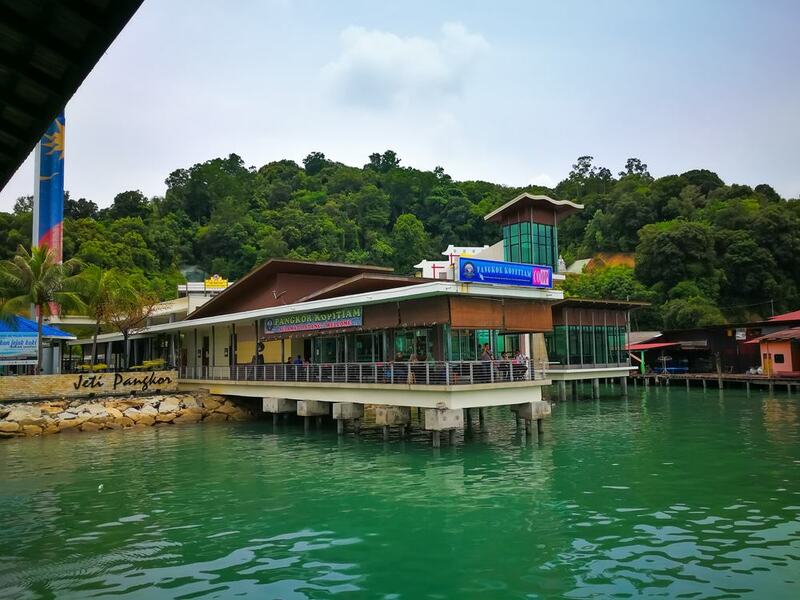 Crazy Tourist uncovers the 15 best things to do in Pangkor Island including the top beaches, where to go snorkeling and how to feed hornbills. 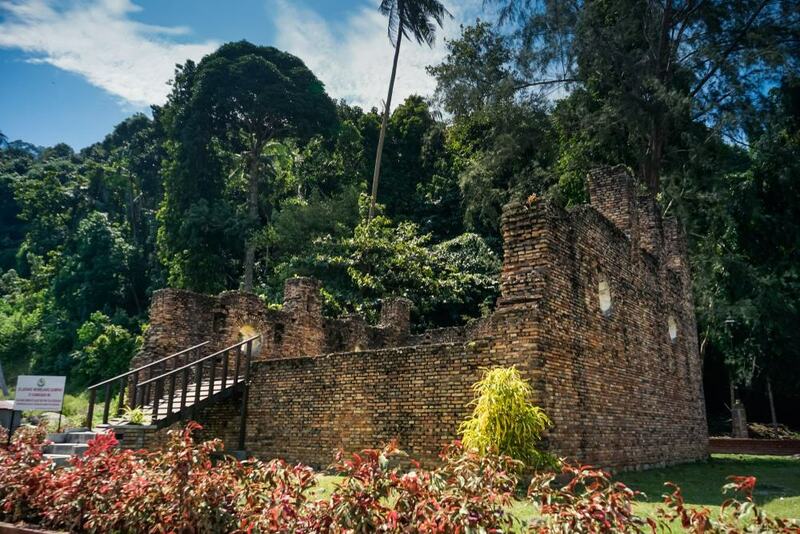 The ruins of Dutch Fort stand as a testament to Perak’s rich colonial heritage. The fort is among the oldest in Malaysia dating to 1670. Back then, the Dutch mined tin in Perak. They stored their supplies in the fort. Rooftop cannons kept the invaders away. Those who dared to approach had a hail of bullets fired through the slit-like windows. Today, the fortress almost looks like it was made using Lego. Worn bricks crumble to ruin. Dutch Fort sits on the southeastern coastline. Information boards explain the fort’s story and provide insight into 183 years of Dutch colonial influence in Malaysia. Hornbills are Malaysia’s quirkiest species. The stout-legged creatures have a double-decker beak and look more like an animation than a bird. Hundreds of these oversized creatures live in Pangkor Island’s jungle. Dozens fly down to Sunset View Chalet every single evening at about 6:30pm. 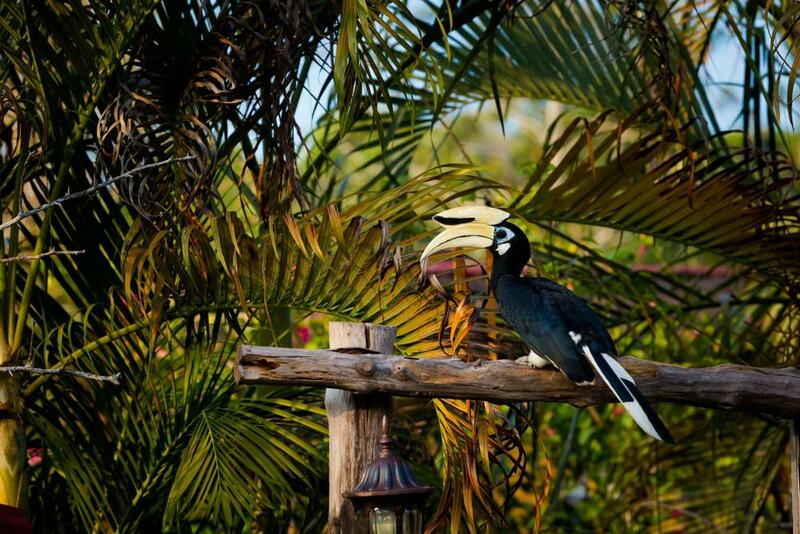 The owners of the guesthouse feed the hornbills chunks of bananas in the same way for years. Head down around 6:00pm. Countless Oriental Pied Hornbills and Lesser Hornbills sit in anticipation on the electricity wires. Watch as the birds swoop down and perform acrobatics to get their dinner. 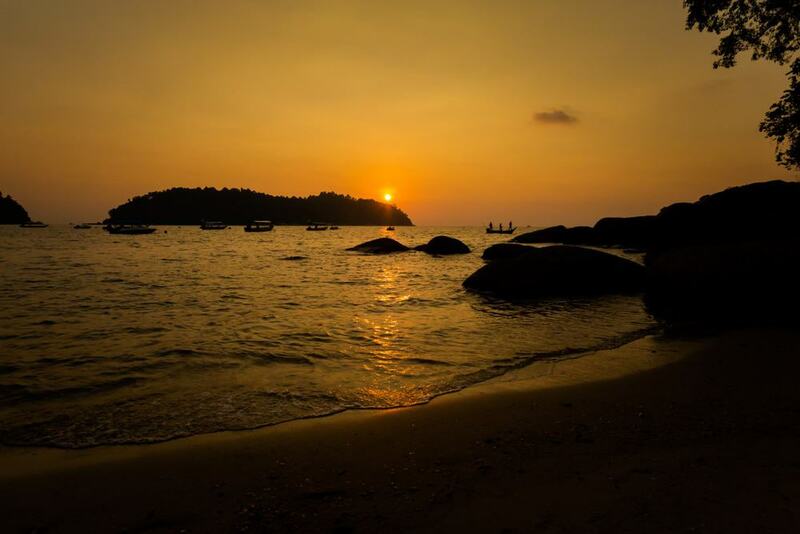 Pangkor Island has dozens of kilometers of coastline and a handful of deserted beaches. Along the west coast, the pristine stretches of golden sand are only broken by the occasional hotel and guesthouse. Sunbathers can lie on the sand watching the gentle waves of the emerald sea roll in. Head to Pasir Bogak Beach on the southern coast. Follow the road through the hills to Teluk Ketapang (Turtle Bay) and Teluk Nipah (Nipah Bay) on the west. Pangkor Island is conservative. Leave the speedos and bikinis in the hotel. Coral Beach is along the western coast separated from Nipah Bay by a rocky outcrop. The sugar-like sand stretches around the golden coastline next to the palms. Hammocks hang lazily between the trees. Around 7:00pm, the sun dips towards the horizon. 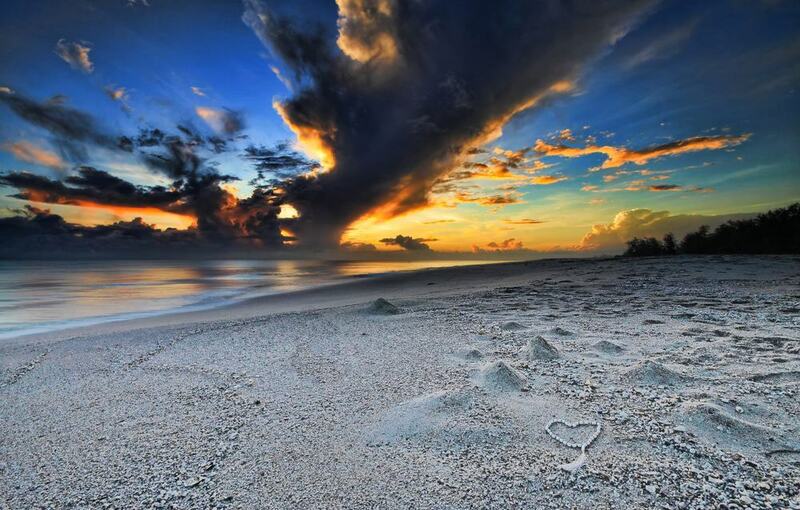 Either sit on the sand and watch the spectacular event alone. Or grab an iced drink and sit on the terrace in any nearby café. Bring a torch. Inky darkness descends within minutes along the poorly lit streets. Neat terraced houses line both sides of the red blocked-paved streets in Pangkor Island’s Chinatown. Red lanterns hang from the roofs of the two-storied homes. The atmosphere feels utterly different from the rest of Malay dominated Pangkor. Wander through immaculate block pathed streets. Photograph the lively colors and traditional decorations. Head to the family-owned restaurants offering Chinese-style street food. Sit and eat on plastic tables in their backyard. Chinatown shows a different side of Pangkor. Either walk from Pangkor Town or stop by while exploring the whole island. 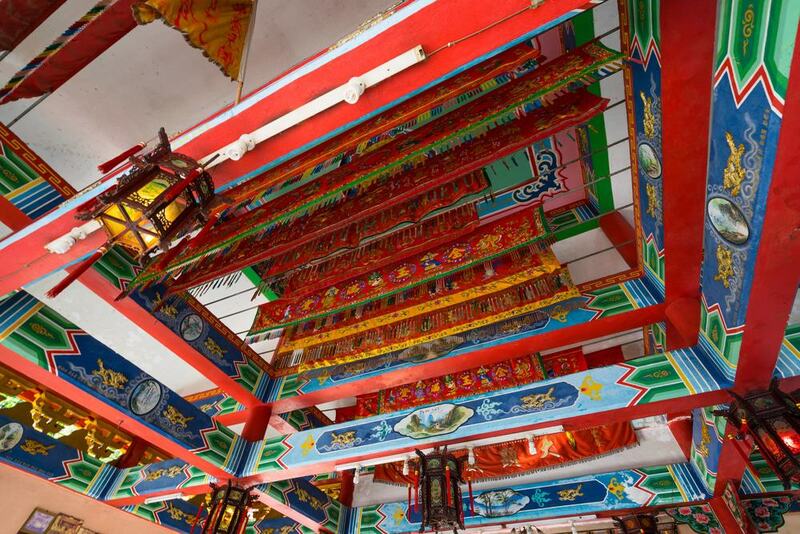 A huge blue and red archway mark the entrance to the Foo Lin Kong Temple. The Taoist temple stands in the heart of Chinatown. Dozens of bronze Buddha statues, spiritual artifacts and Taoist relics decorate the inside. 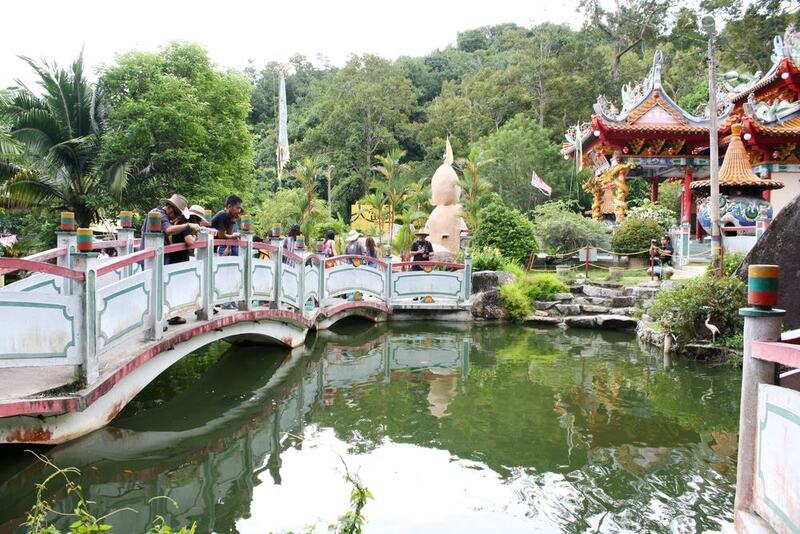 But what sets Foo Lin Kong apart from other temples in Malaysia is the stunning gardens. Follow the steps on the right and find a replica of the Great Wall. Snap photographs of the mysterious ‘Rock of Fate’. The highlight is the turtle pond located halfway up the steps on the right-hand side. Hilly terrain and thick forests cover most of Pangkor’s interior. 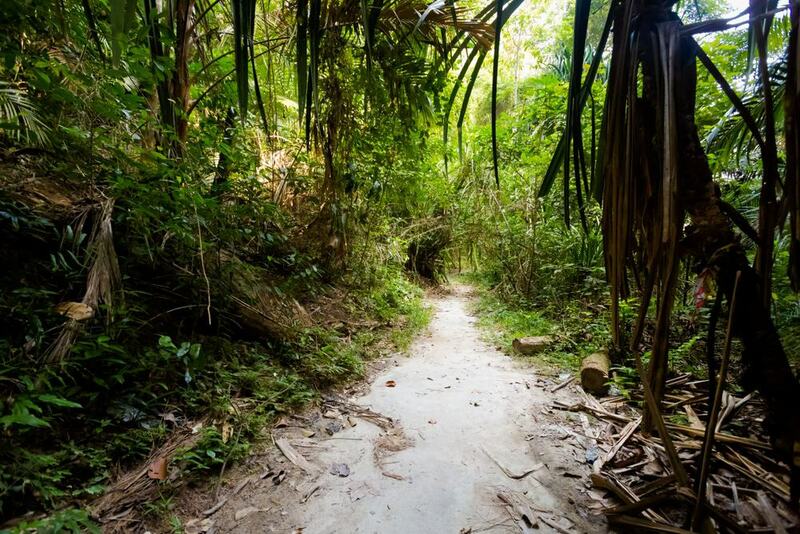 A path near Pasir Bogak leads to the summit of Pangkor Hill, the island’s highest point. The peak rises slightly higher than 350 meters (1,148 feet). Marked trails lead through the lush jungle vegetation to the background sound of cicadas and buzzing insects. Howling macaques swing above as giant hornbills glide overhead. Expect a moderate level of difficulty. Most hikers take about one hour to reach the top. Bring water. Reward yourself with a picnic overlooking sweeping views of Pangkor Island. Nipah Bay on the western shoreline is a water sports haven. Locals rent everything from jet skis to canoes to kayaks. The most memorable way to see Pangkor’s striking beauty is from the sea in a kayak. Start by exploring the shallow waters in Nipah Bay. Kayak to Coral Beach through the gentle waters. Then head further north towards the steeper hills and discover hidden coves. Several companies rent kayaks. Ask around and find the best offer before accepting. Rent snorkeling equipment and bring it with you. Northern Pangkor hosts the island’s most active marine life. 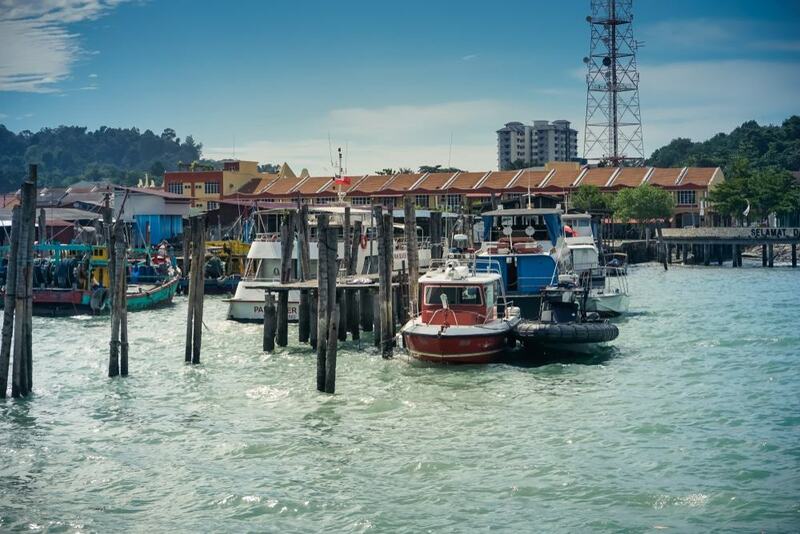 On first glance, Pangkor’s pier might not seem like the most attractive part of the island. But looks are often deceiving. Peer down and find fishing boats, ferries and flat-bottomed sampans moored in the jetty. The islanders have lived off the sea for centuries. Visitors can stand near the jetty and watch the fishermen arrive with their catch. Keep your eyes open for the sampans bobbing up and down. Pangkor Kopitiam (a Malaysian-style café) overlooks this hub of activity around Pangkor jetty. Grab a coffee and watch the world of a Malay fishing community unfold. 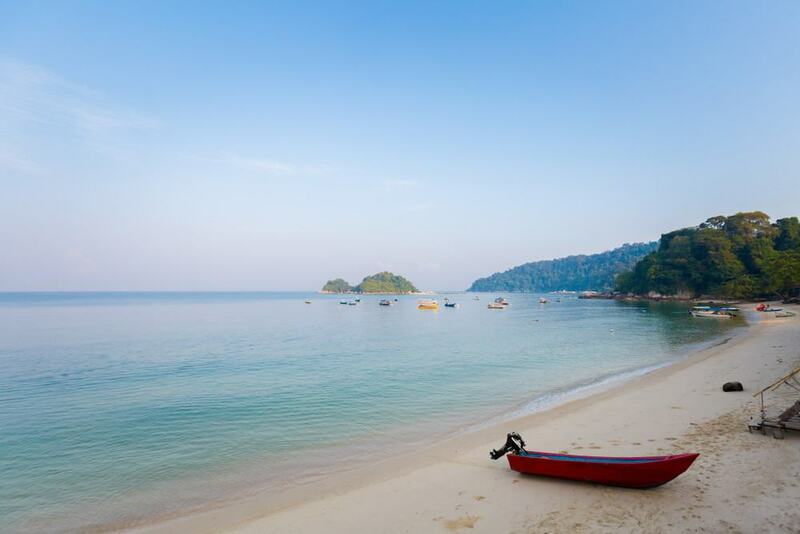 Pangkor Island has some of Malaysia’s calmest and clearest waters. Nearby Sumatera takes the full force of the Indian Ocean. The waves reduce to a gentle roll when they reach Pangkor. 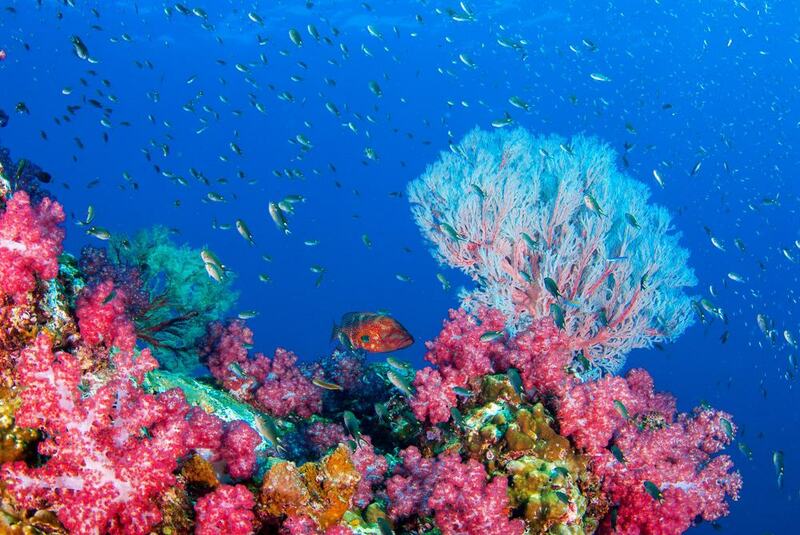 This allows coral reefs to flourish, which act as a breeding ground for countless species of tropical fish. Green and pink parrotfish swim above the colorful and geometric coral. Rent snorkeling equipment in Nipah Bay. Head out solo into the gentle waters along the western and northern shores. Or splurge on a tour and discover secret sites. Pangkor Island gets only a handful of tourists. Pangkor Laut Island, its baby sister, gets even fewer. 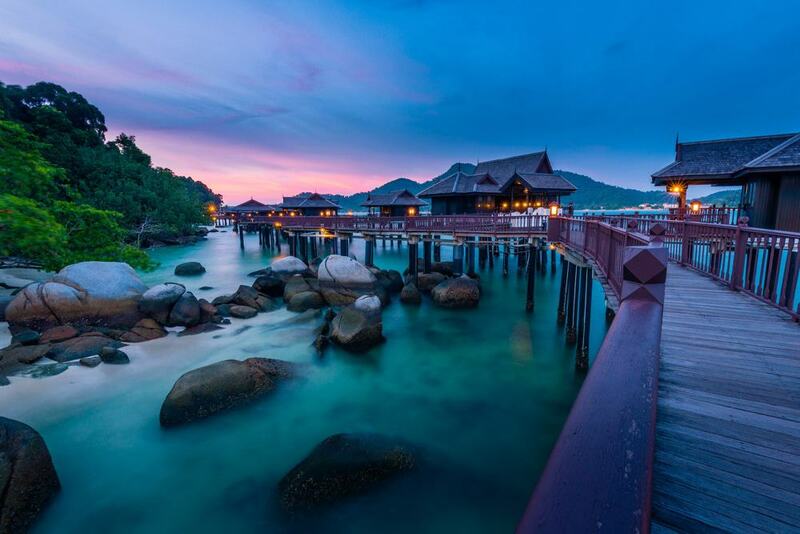 Rather than guesthouses and a beach lifestyle, Pangkor Laut has a more elegant atmosphere. Fisherman’s Cove is the go-to place. The restaurant/bar has coastal views like those in the Maldives. Expect fresh seafood, sumptuous desserts and a romantic ambience. Take a speedboat from Nipah Bay. But leave the sandals and flip-flops. Fisherman’s Cove enforces a strict smart-casual dress code. What’s a better way to get a perspective of Pangkor Island than from a boat? Boat trips start near Nipah Bay on the west coast. 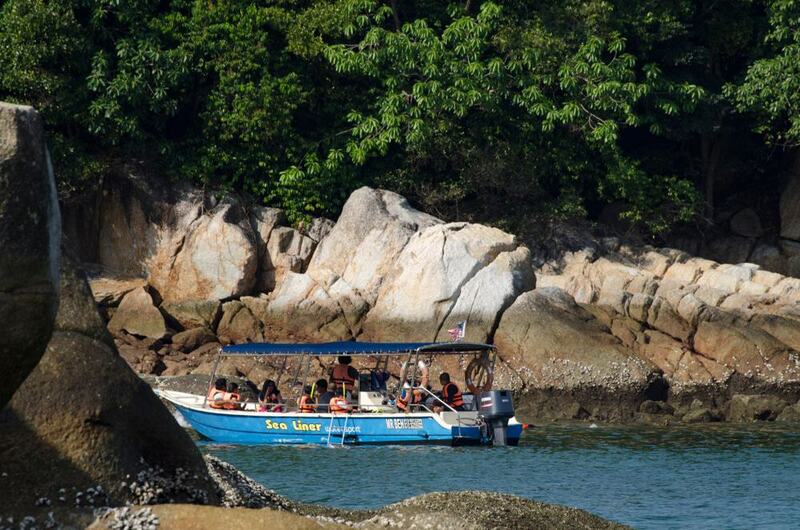 Some sail for 30 minutes around the shoreline; others ferry passengers to and from Pangkor Laut. Longer cruises explore further afield taking passengers to hidden inlets and secret bays. Boats offer a convenient vantage point for watching wildlife. Monkeys are visible in the trees while the world below the waves bursts with life and activity. Boats moor on the sand near Nipah Bay. Bargain hard to get the best price. Pangkor Town consists of a single street with a handful of cafés and restaurants. Wander through the shophouses and search for souvenirs or snacks. Or check out the antique stores with forgotten relics from previous generations. Watch the day-to-day life of the islanders. Head north to tiny fishing villages. Admire the colorful houses and their slower pace of life. Look towards the rickety stilted villages as fishing boats sail in and out. 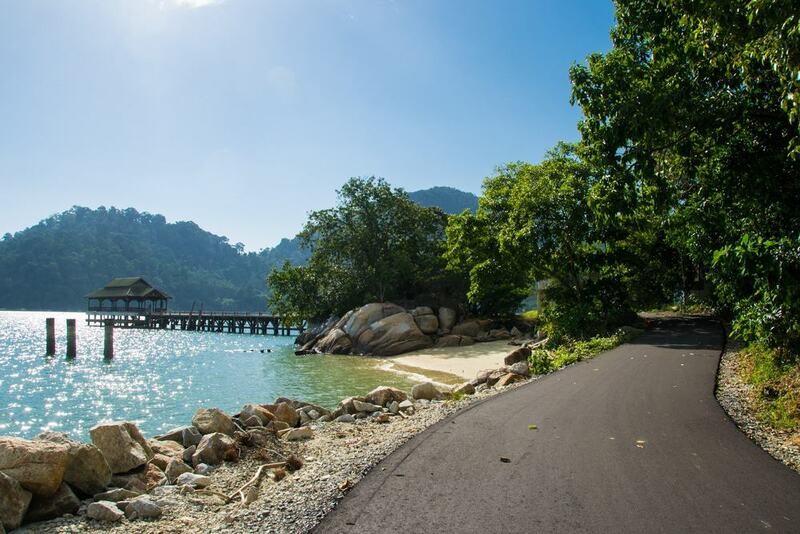 A road leads around Pangkor Island past beaches, mountains and sleepy villages. Start at your guesthouse and choose a direction: left or right. Follow the road and you’ll loop back to your starting point. This gives you the chance to appreciate the scenery, environment and habitats. Some travelers rent a motorbike and ride around the island. Others take the challenge of cycling or walking. Get ready for steep hills. Watch out for speeding taxis taking up both sides of the road. Pulau Sembilan, translating to Nine Islands, are a mini-archipelago south of Pangkor. The uninhabited islands host some of Malaysia’s best diving and snorkeling areas. Boat trips start in Nipah Bay before bouncing over gentle waves for 20 kilometers (12.4 miles). Snorkelers will encounter a series of hard corals and barracudas. Divers head to White Rock where hundreds of parrotfish swarm in the depths. Armies of micro-organisms sometimes transform the sea into a glowing mass of color. But you need to be here at the right time to witness this rare natural event. Pulau Sembilan isn’t open all year. Diving typically takes place between November and March. If you want to go diving, it’s often better to arrange a tour from a company in Kuala Lumpur.